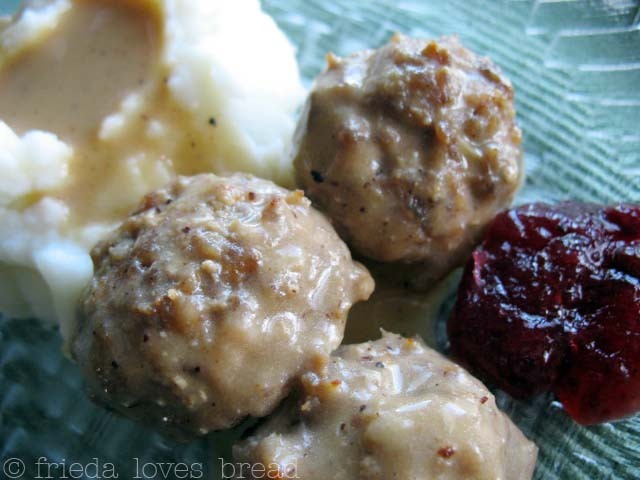 Frieda Loves Bread: IKEA Swedish Meatballs: Svenska Köttbullar! 17 IKEA Swedish Meatballs: Svenska Köttbullar! If it looks unrecognizable, I won't don't eat it. What's in that soup? If I can't pronounce, I won't don't eat it. Svenska Köttbullar??? If you live near an IKEA, you might. These are a mildly spiced lean meatball served in gravy. You can choose to have noodles, rice or mashed potatoes with the gravy. It's a close cousin of Beef Stroganoff, although it is milder than that. 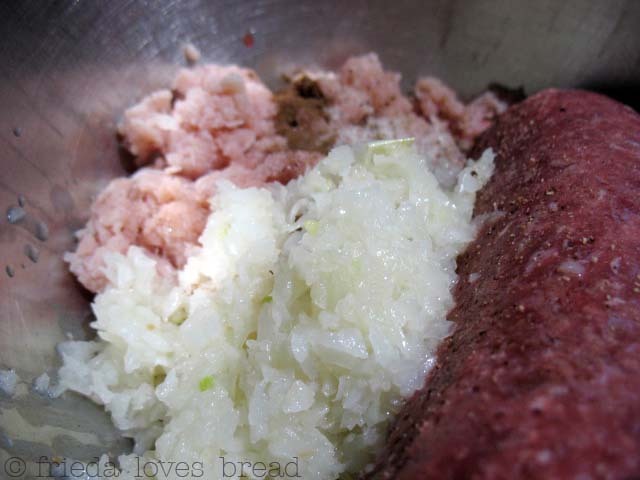 This recipe calls for ground beef with ground turkey or pork. I didn't have any ground pork, so I threw some thawed out Costco boneless pork chops into my food processor. Did it work? 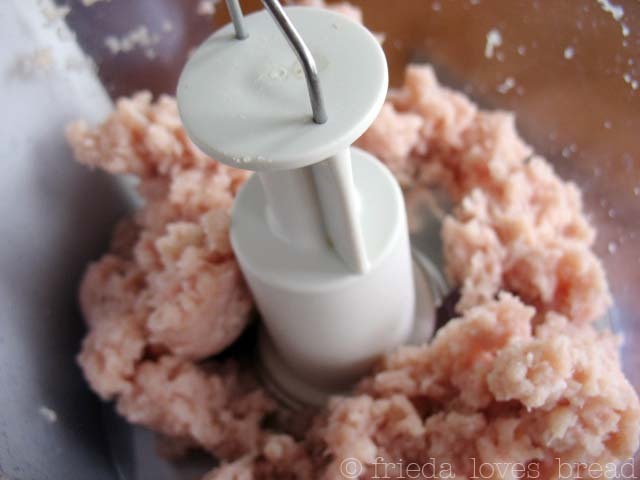 I think so.... Don't need a fancy schmancy meat grinder! 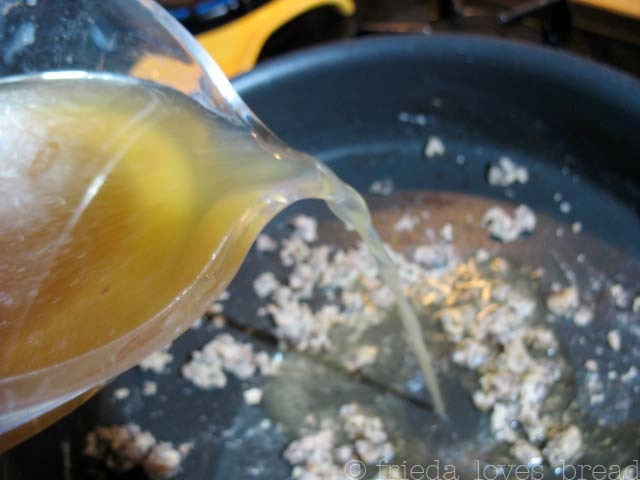 To the meat mixture, add sauteed onion, salt, pepper, allspice, nutmeg and egg yolks. Typically, the best tool to mix this is your HANDS. 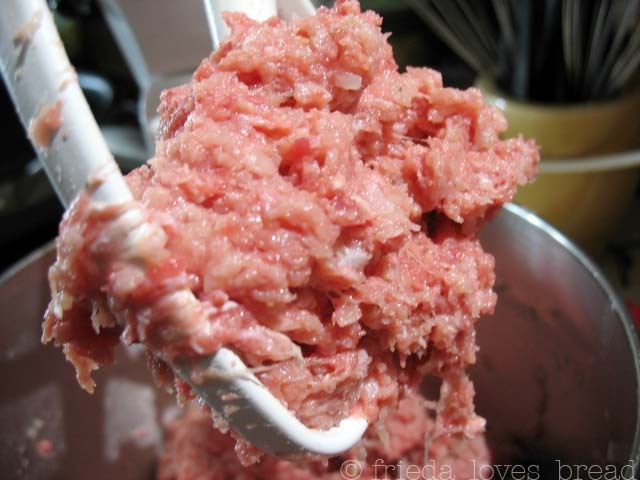 I cringe when I have to touch raw meat and was thrilled when the recipe said to put it in my mixer with the paddle attachment. Who would have thought? Genius. I like to use my 2 T. cookie scoop for meatballs. If you want perfectly round meatballs, by all means, pick them up and roll 'em in the palms of your hands. 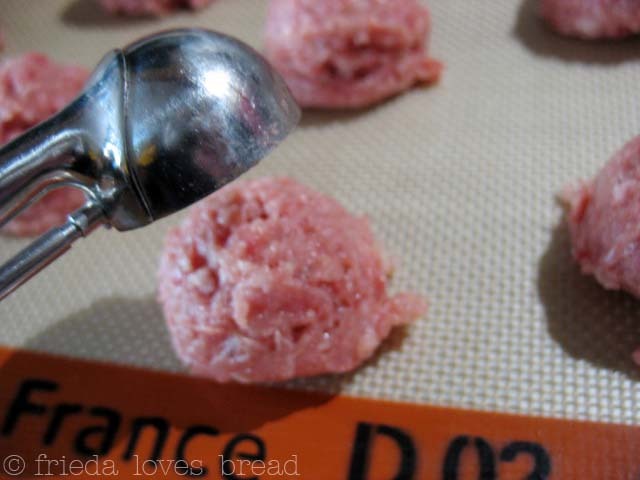 Although the recipe calls for cooking the meatballs in the skillet, I like to bake them. Standing over a hot skillet, slowly turning meatballs and having them fall apart on me is not my idea of fun. These only took 15 minutes in the oven. and QUICKLY stir it to get all the lumps out. 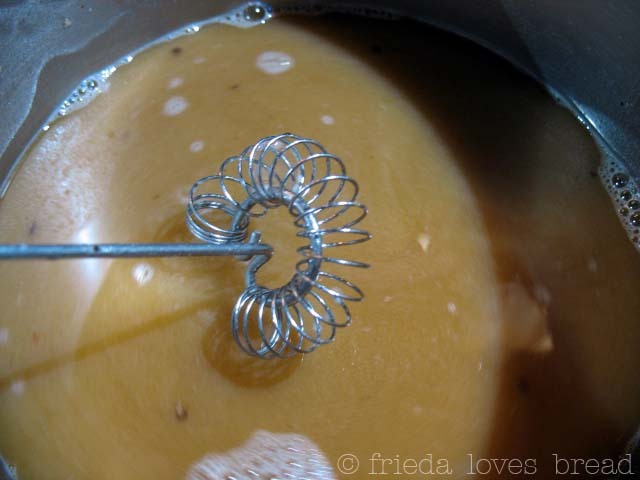 This flat whisk from Pampered Chef is a great gravy/sauce kitchen tool ~ If you don't stir quickly or thoroughly enough, you will get lumps in your gravy. Heat it up to almost boiling, still stirring, till you get it as thick as you want. If there is any one thing my mom taught me, it was how to make gravy. But that's okay. I make an awesome gravy! and don't forget the lingonberry preserves, or lingon bevarar! Mix together bread pieces and milk. Set aside. In a skillet over medium heat, melt 1 T. of butter. Add onion, pinch of salt and cook till onions are soft. Remove, and set aside. In the bowl of a stand mixer, combine the bread mixture, ground chuck, pork, egg yolks, 1 t. salt, black pepper, allspice, nutmeg, and onions. Beat on medium speed for 1 to 2 minutes. Using a 2T. 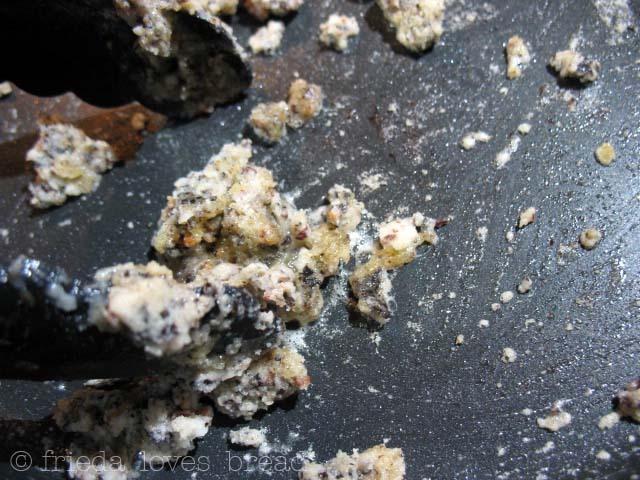 cookie scoop, leveled off, and place meat onto baking sheet. Bake in 350ºF oven for 12-15 minutes. Heat the rest of butter in skillet over med-low heat, add the meatballs, cook till golden brown on all sides, about 7 -10 min. Remove the meatballs; place in the warmed oven. Decrease the heat to low and add the flour to skillet. Whisk until lightly browned, approximately 1- 2 minutes. Gradually add beef stock and whisk quickly till sauce thickens. Add the cream, cook till the gravy reaches the desired consistency. 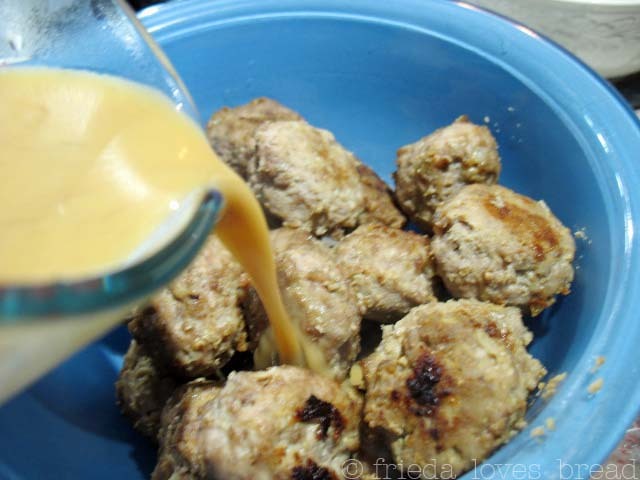 Pour gravy over meatballs. I love IKEA, and I love their food too! Thanks for sharing your recipe! I love IKEA's meatballs and yours look just as good!! We love Swedish meatballs. I even made them for our son's wedding -- his request! You can bet I bakeed those meatballs as that was a LOT of meatballs! I have not had Ikea's meatballs, I never seem to be there when a meal is appropriate and I'm usually in a hurry, unfortunately, I love the place! YUM!! My mom used to make these especially for me when I was young. I LOVE swedish meatballs. Ikea's are good, but homemade can't be beat. Looks delicious! I agree....homemade IS best and yours look amazing! Cindi, did you find the piece of furniture on the floor? If so, you can buy it at a discount. They didn't have the 5x5 Expedit bookcase that I wanted and couldn't tell me why it was discontinued only in Draper. Four long months later, there it was! It may come back again ~ you never know. I did check around and could not find it on the floor, so I asked an employee, and was told that they discontinued the entire line and replaced it with another line that is ugly! They agreed that the one I wanted was much better looking. 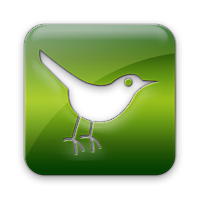 Go figure why something is discontinued, but I will keep watching for it...maybe it will come back. I want to get some cabinets for my laundry room...the white cabinet doors that look like bead board. Well, the kitchen display with that style cabinet door has been removed and another door style was put up. Now I'm afraid the one I want will be discontinued. I told my husband we should hurry & order before that happens! BTW...I also have the Expedit bookcases. 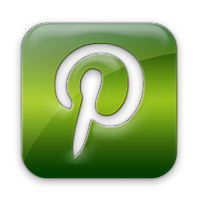 They are great for organizing the fabric in my sewing room! Funny! 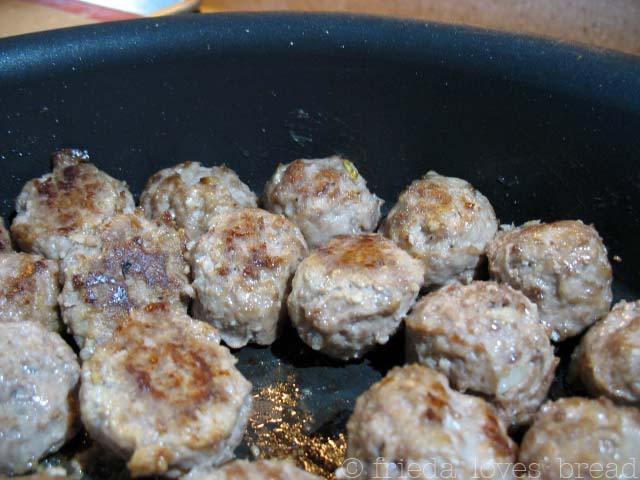 I just posted Swedish Pancakes and mentioned I'm on the lookout for a good Swedish Meatballs recipe. I love lingonberry jam as a condiment with this dish. It's great comfort food! What a great post and wonderful looking recipe. Yum. Cannot wait to make it. They look delicious! 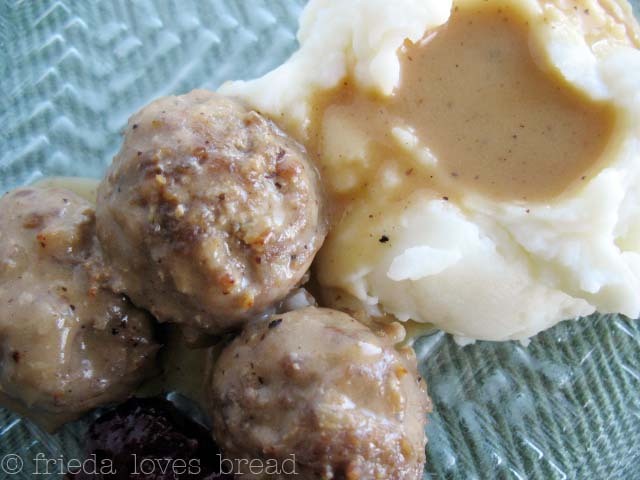 I love swedish meatballs and agree need to be pan fried to get all the goodness for the gravy! Stop the presses! I LOVE Swedish meatballs! I totally have to make these!